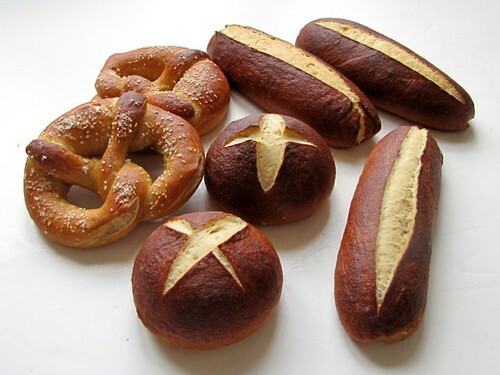 Pretzels and Pretzel Buns ~ I Can Do That! 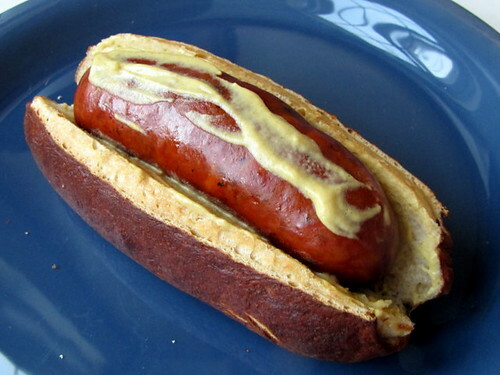 I have been reading about store-bought and homemade pretzel dough shaped into burger and hot dog buns. I have always wanted to make pretzels that are chewy and have thin dark crusts and thought the recipe from Jeffrey Hamelman's BREAD would be a good one to try. I followed the recipe as written but I didn't poach the dough in lye and water solution because I don't have lye. I boiled the pieces in baking soda and water instead and they came out wonderfully dark brown all over, are soft and chewy and so delicious. The pretzels sprinkled with sea salt are so yummy simply dipped in yellow mustard and the meaty sturdy hot dog buns are perfect with the jalapeno cheese German sausages that a friend gave me. The bread takes 2 days to make because of the 12 - 16 hour pre-ferment which I usually prepare at about 6PM and let it sit on the kitchen counter overnight. It's ready for mixing the next morning. If you love pretzels I highly recommend this easy recipe and the book, BREAD by Jeffrey Hamelman. Prepare the pâte fermentée: Stir the yeast into the water, then mix in the flour and salt until smooth. Cover with plastic film and let stand for 12 to 16 hours at 70°F. Prepare the dough: In the bowl of a standing mixer with the paddle attachment, add all the final dough ingredients except the pâte fermentée. Mix on the first speed for 3 minutes. As the dough is coming together, add the pâte fermentée in chunks. The dough will be a bit stiff. Increase to second speed and mix for 5 to 6 minutes. Transfer into a container, cover with plastic wrap and leave to rest for 1 hour. Transfer the dough on the kitchen counter, flatten slightly into a rectangle and fold one third over to the left and the other third over to the right like a letter. Turn 90 degrees and fold again from right to left then left to right then flip over and return to the container seams side down. Cover with plastic wrap and leave for another hour. Shape the dough: Divide the dough into 3-ounce pieces. Round the pieces for burger buns and roll with your palm. Place on a parchment lined sheet pan 3 inches apart and flatten the dough to less than 1 inch thick. Cover with plastic film. For hot dog rolls, flatten into a rectangle 5 x 3 inch rectangle and roll tightly, using the heel of your hand to seal the seams. Roll into a a 6-inch log. Place on the sheet pan and cover with plastic wrap. To shape the pretzels, roll the pieces into a log. Let the logs relax for a few minutes, covered with plastic. Roll the logs to 16 inch long with the center thicker than the ends. Twist the ends twice and press on the sides or near the bottom. Arrange on the parchment-lined sheet pan 3 inches apart, adjusting the shape. Cover loosely with plastic wrap and let rest for 30 minutes and preheat the oven to 450°F. Remove the plastic and let stand for another 10 minutes. Prepare the water: Heat the water to boiling and add the baking soda. It will bubble. Turn the heat to medium and poach the pieces, 2 at a time, 30 seconds on both sides. Remove with a skimmer and return to the sheet pan, good side up. Score the buns: For the round buns, with a sharp knife score the top with a ¼-inch deep cross; hot dog buns, straight down the middle. Sprinkle pretzels with coarse salt or seeds and score the bottom, if desired. Bake the buns and rolls: Put the pans in the oven and bake for 15 to 20 minutes or until buns are dark brown, rotating pans halfway during baking. Enjoy while warm. That looks so good. I have been meaning to try pretzel bread for a while now. That looks perfectly done! ang ganda naman nyan Oggi, pati yung huling photo! Just came over from Natashya's site, Living in the Kitchen with Puppies. 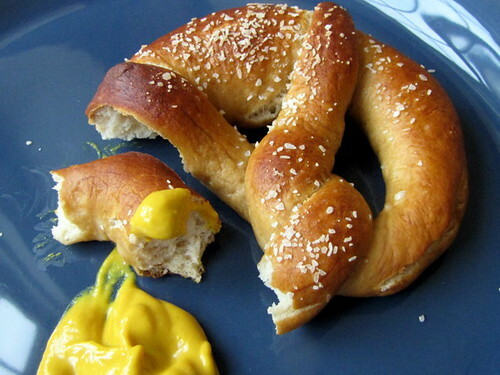 I have a real weakness for soft pretzels and absolutely love your pretzel buns and hot dog buns. Looks wonderful! Came through Natashya blog. 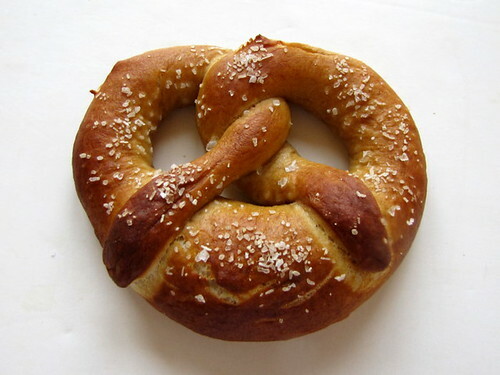 Nice Soft pretzel. I love to make them. They look beautiful Oggi, I think this is the way I will try to do them. Lovely photos and post!